Cystopteris protrusa, I_TQBH5056. © Copyright Bobby Hattaway 2011 · 5. discoverlife.org (Accessed 12/2014). 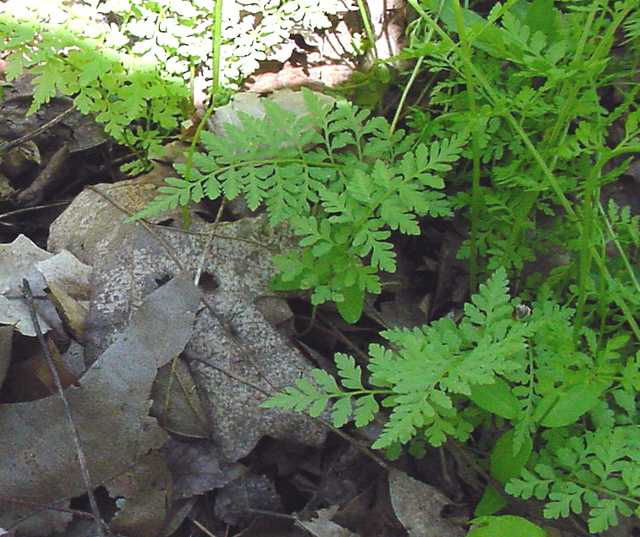 Cystopteris protrusa is a fern much like C. fragilis, but rhizome is long-creeping, densely hairy, and the growing point extends 2-4 cm beyond the leaves. 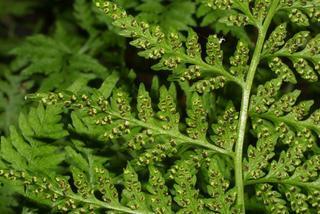 Cystopteris protrusa.Steve Baskauf.www.discoverlife.org (Accessed 12/2014). Leaves more scattered, midribs of leaflets with scattered glands, lowermost secondary leaflets wedge-shaped at base, often with a short stalk. Frequency in NYC: Rare, NYS, S1, E. One location only. Population enhanced with greenhouse grown individuals raised from this parent stock.